OAKLAND, Calif. (KGO) -- Elephants, giraffes, lemurs, and even a cockroach at the Oakland Zoo have been exploring their creative sides to produce colorful paintings that will be auctioned for charity. 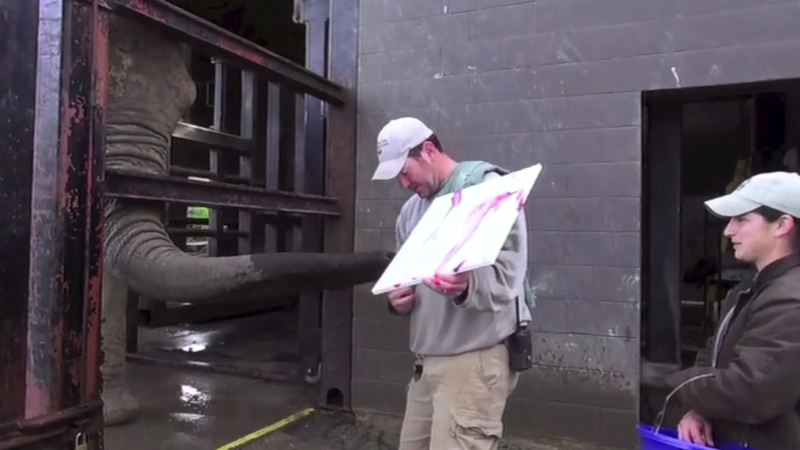 The painting sessions were conducted by zoo keepers who used only positive-reinforcement, including plenty of treats, as they worked with the animals, zoo spokeswoman Nicky Mora said. Elephants were helped to hold paintbrushes in their trunks and giraffes in their mouths and produced their artwork one stroke at a time. Goats, lemurs, and meerkats had their hooves, paws or claws dabbed with nontoxic, water-based paint and ran over a blank sheet of poster board while chasing a treat. Thirty-two of the works will be auctioned on eBay starting Thursday. Andy, a Madagascar hissing cockroach, scurried around a canvass and the result was a piece in purple, green and yellow tones. Maggie, a Nigerian dwarf goat, had her hooves dipped in blue, green and yellow paint and the keeper coaxed her with snacks to walk on a canvass. None of the animals was forced to take part, she said. Last year, Oakland Zoo auctioned off twelve paintings and raised nearly $10,000. The bidding this year will end Sept. 20 and the funds raised will benefit Oakland Zoo's conservation partners, who are working in the field to save wild animals, Mora said. Some of the paintings will be exhibited starting Thursday and through September 20 at The Blueprint, a tea lounge, in Oakland.